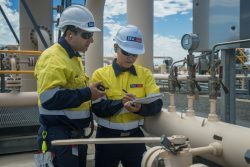 SEA Gas was established in 2002 to develop, own and operate the 700km underground high pressure natural gas pipeline transmission system from Port Campbell in Victoria, connecting the Otway and Bass Basins, to Adelaide in South Australia. SEA Gas is a partnership owned by both APA Group (50%), an ASX top 50 company, and Rest [Retail Employees Superannuation Trust] (50%), an industry superannuation fund. Construction of the SEA Gas pipeline commenced in October 2002, 180 km south east of Adelaide near Tintinara. The entire pipeline route was cleared and graded to provide a safe working area for the construction crews. Areas were set aside so that topsoil could be stock piled to allow for full restoration of the disturbed areas after the pipeline had been laid. Special care was taken to protect environmentally-sensitive areas. Specialised machinery was used to dig the trench in which the pipeline was laid. Line pipe arrived by sea and was delivered to site by road and rail. Pipe sections were “strung” along the route prior to welding. To keep the gas flowing on its 700km trip from Port Campbell to Adelaide, the gas needs to be compressed along the way. A compressor is a pump specifically designed for gas. Two compressors have been installed to date, one near Hamilton in Victoria and the other near Coomandook in South Australia. The maximum allowable pipeline operating pressure is 15 MPa or a little under 150 times atmospheric pressure. Each compressor station is equipped with a Solar “Centaur” compressor plus gas turbine driver. Each unit is rated at 4.5 MW, roughly equivalent to thirty family sedans. For more specific information regarding The Pipeline System please visit here.